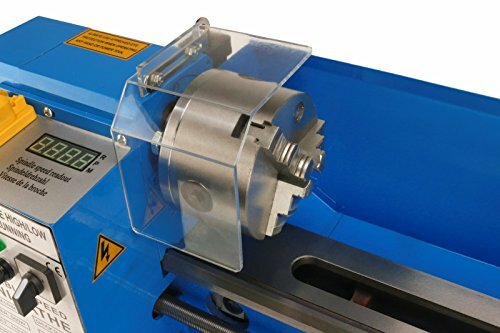 What is the best metal lathe you can buy today? There’s a number of options available within a wide price range. 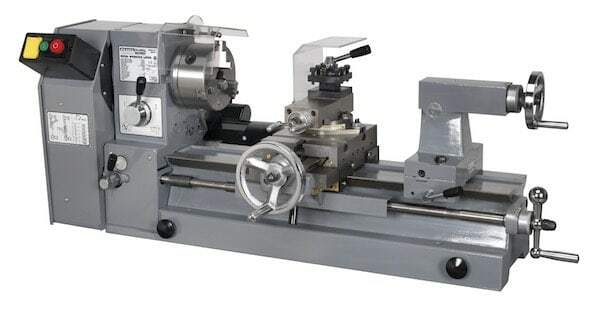 To narrow this down today, we will look at small metal lathes suitable for the home workshop, farm and semi-pro use, (we will leave out the large 5 figure dollar industrial sized lathes). The table below will show you our top 5 picks at a glance. For our dedicated metal lathe buyer’s guide and full reviews of each, keep on reading. 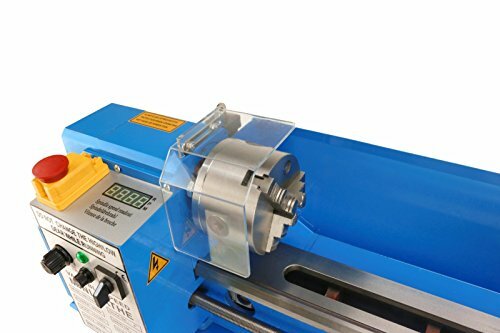 In our humble opinion, the Grizzly G0602 is the best small metal lathe you can buy today. 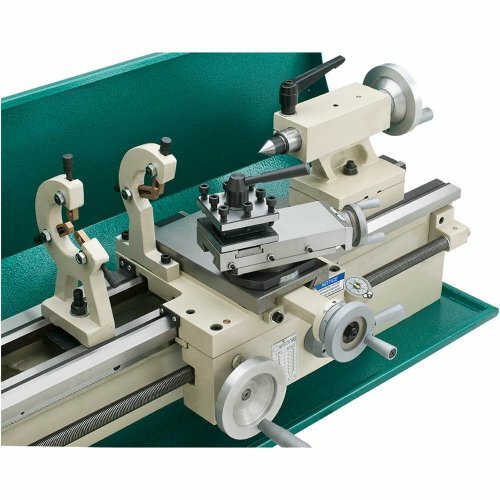 It is packed with features, is very built and comes in at a price suitable for most home machinists and semi-pro engineers. First off, the dimensions are very good indeed. The 10 x 22 inch lathe size will accommodate a wide range of projects and when combined with the generous thread ranges and multi speed capability, you have a very versatile machine on your hands. The Grizzly G0602 can tackle some solid projects too. Featuring a 1-inch spindle bore and a 3/4-inch x 12 TPI lead screw the machine is definitely not lightweight in its functionality. The MT#3 tailstock is exactly what we suggested you should aim for within our metal lathe buyer’s guide. Quite simply, the G0602 does a good job of beating other lathes of this size; very few have the same range of threads. Versatility is the name of the game here. Grizzly have designed a machine capable of 33 inch threads from 8 to 72 TPI and 26 metric threads from 0.25mm to 3.5mm. Impressive to say the least. Looking at some of the other specifications for a moment: The amount of power is more than adequate for a small workshop. The single-phase (so runs of domestic electrical outlet) 1hp, 110V motor provides the overall brawn. The Grizzly 0602 also features a 1-3/4-inch x 8 TPI spindle with MT4 spindle taper. Carriage and cross slide travel add to the versatility with the lengths coming in at 18 ½ and 6 ½ inches respectively. Some may find the included 4-way toolpost inconvenient, (although it really does depend on what you are used to). Despite being a well-constructed toolpost, some customers have voiced preference for a quick-change toolpost instead. The hardened and ground V-way bed is a joy to work with and the oil bath gearbox does help keep serious maintenance down to a minimum. The fact is the G0602 is built to last. Grizzly have not scrimped on materials on either the body of the machine or the main components. Weighing in at 432 pounds, it certainly is a sturdy beast. oil-bath gearbox and tool box with service tools. The 1-3/4-inch x 8 TPI spindle with MT4 spindle taper. Overall the Grizzly 0602 is a high quality small metal lathe, more than deserving of our top rated pick. The entire machine seems to have been designed with the home machinist in mind. It has great capacity, more than enough power for a wide range of jobs, and is built to last. And all that at a very competitive price. What more could you ask for? If our top pick Grizzly 0602 didn’t meet your requirements with regards to power and capacity, the Jet 321360 might just fit the bill. Your wallet will have to be a bit deeper for this metal lathe from Jet, however you do get what you pay for. This is a formidable machine. 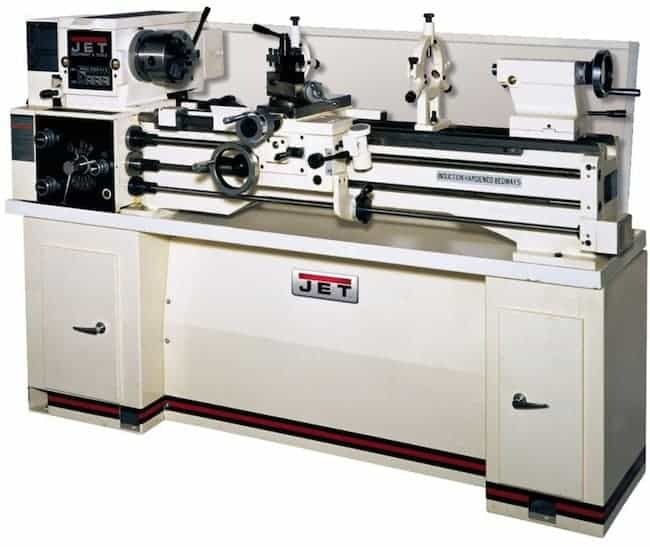 Jet are by no means newcomers to the world of industrial machine tools (covering both the home and professional workshop). 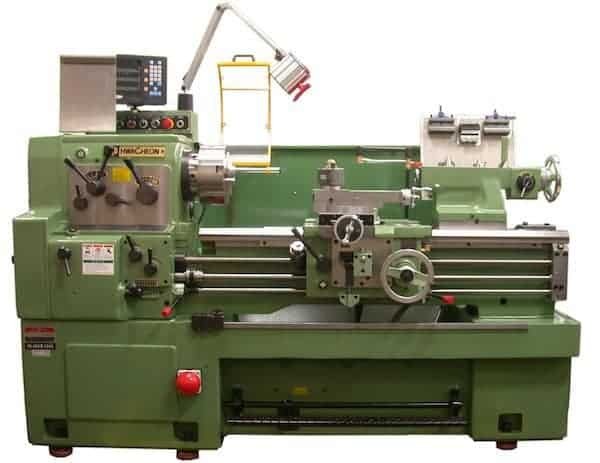 The BDB-1340A, is a 13 x 40 inch belt driven lathe that is precision built and designed to last. Under the hood is a powerful 2 HP, one-phase, 230V motor. The variable speed capabilities on the Jet are most impressive too. The 12 spindle speeds ranging from 60-1240 RPM, (note that bottom end speed – this will allow for very good control on delicate tasks). A big plus point is the fact Jet opted to include an enclosed, quick-change gearbox with helical cut gears, (a design that reduces noise emissions). The system works very well, allowing for fast, efficient gear changes to suit your work needs. The set up also allows for metric threading. We mentioned the gap bed in our buyer’s guide. The Jet has a gap bed section that increases the versatility of the machine exponentially. Larger diameter work can be carried out with ease on the BDB-1340A. The all-important spindle is supported by precision tapered roller bearings. The main spindle controller is also carriage mounted. The tailstock may be offset for turning tapers and also has the capability for inch and metric threads. Other great features include the independent leadscrew and feed rod, low voltage motor controls, and an induction hardened and ground V-way bed. Of course, when spending a large amount of money on a tool, you will want that peace of mind of a reliable warranty and support service. Here, Jet really do shine. The company backs all its machines with an industry-leading two-year warranty. After purchasing the JET 321360A BDB-1340A, you automatically receive premier customer support and back up from over 750 authorized service centers across the USA. In most cases, the Walter Meier Authorized Service Centers will be in a position to authorize warranty repair, assist you with routine maintenance or in obtaining parts. 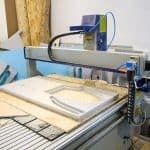 The machine may be priced above the budget range of the average home machinist. The Jet 321360A BDB-1340A is an excellent machine for those looking for more power and capacity than what is provided from our top pick Grizzly. It is more expensive, however the capabilities of the lathe along with its versatility will ensure you will not outgrow its uses anytime soon. A highly recommended investment if your budget allows. 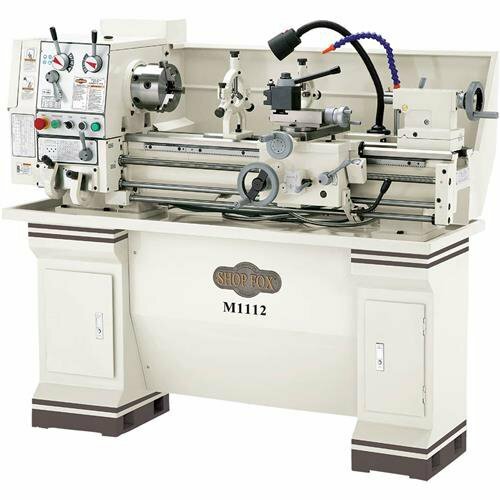 The Shop Fox M1112 is another premium metal lathe that could appeal to the home mechanist with a sufficient budget. 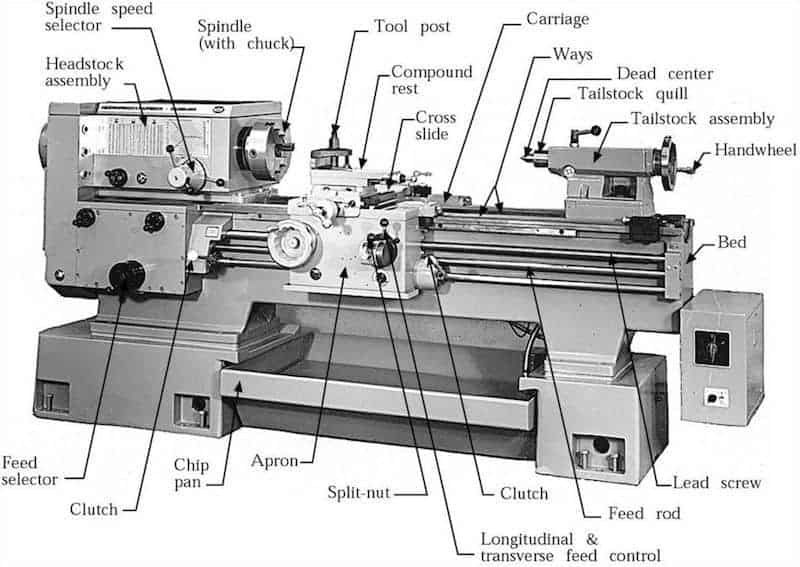 And don’t be put off by the name – it may be a gunsmithing lathe, however this is an indication of the intricate control you can achieve with this machine. The tool’s precision is suitable for all manner of turning tasks. As 12 inch by 36 inch lathe, the Shop Fox is a smidge smaller than the Jet, however it does pack in a similar amount of quality features. It is variable speed of course, the low end of the range coming in at an impressive 70 rpms. The top end is good too at 1400rpms, (by way of comparison, the Jet peaks at 12,40rpms). Shop Fox have fitted this gearhead lathe with premium quality components. High-tolerance bearings and a D1-5 camlock spindle form the heart of the machine. The gearbox is quick-change too. Operational control is a real selling point on the M1112. The extra fine longitudinal feed rate of 0.0011 inches/r and cross feed rate of 0.0004 inches/r help ensure intricate results on demanding projects. 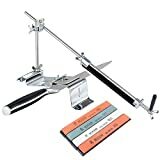 Other great features include a heavy-duty vibration dampening stand, a follow rest and steady rest (both ball bearing tipped) and an adjustable tailstock for precise chuck-to-tailstock alignment. As you would expect the build quality is almost tank-like. 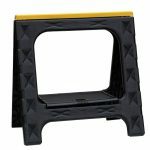 The hardened and ground cast iron stand with extended base gives you the stability you need, while adding to the already robust total shipping weight of 1410 lbs. The list of features doesn’t stop there either. 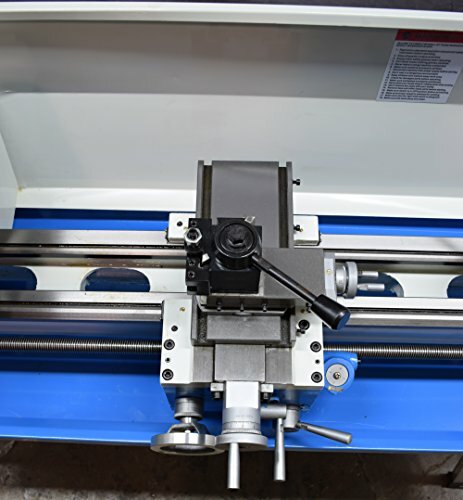 The Shop Fox M1112 comes with a removable gap bed that allow for wide diameter turnings up to 17 inches. There’s a full-length splash-guard, a built in halogen work light for dim conditions, and an additional coolant system to keep components and materials from overheating. The included quick change tool post (featuring a piston style mechanism) makes changing out tooling quick and easy. Which is a good thing considering the M1112 is capable of 29 different metric threads, (gear changes are required to achieve the full range). 1/2 inch drill chuck with MT #3 arbor. Cross feed range: 40 at 0.0004 inches – 0.0105 inches in./rev. Cross feed screw is not as good as it could be, makes repeating dimensions difficult. Being piston type the supplied quick-change tool holder is not overly accurate. You may find that the paint is too easy to chip. For close tolerance work the Shop Fox M1112 is an excellent machine. The fact it is designed with gunsmiths in mind, gives you an indication of the precision work you can achieve with this lathe. The few quibbles are by no means deal breakers. Overall a great machine for the money that comes highly recommended for home, farm, or hobby machinist. 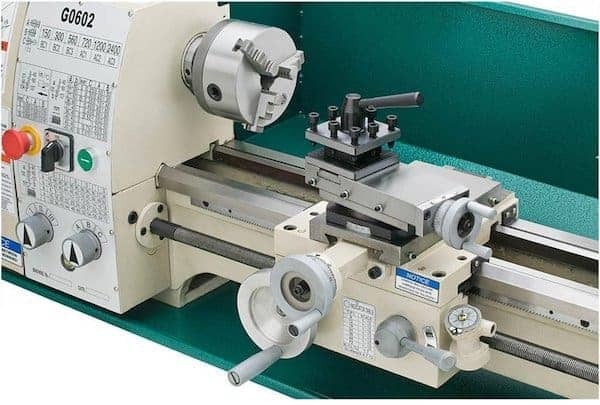 The PM-1030V metal lathe from Precision Matthews takes the power and features down a notch when compared to the other lathes in our top 5 list – however, this could easily make it more suitable for some home machinists. The machine carries a 1HP 120V single-phase motor under the hood, (half that of the Jet and Shop Fox, but the same as our top pick Grizzly). The lathe does have variable speed control. The spindle speed range is impressive actually, running from 50 – 2000rpms. One area the PM-1030v shines is the fact it comes equipped with longitudinal feed and power cross feed; a feature unusual for a machine of this size and price point. The spindle bore is a standard 1inch. The lathe also comes with a wedge type quick-change tool post. Build quality has not been compromised on the PM-1030V. Precision Matthews have opted for precision tapered roller bearings in both the ground gears and shafts spindle. The gearbox is also enclosed in an oil bath with lubricated feed. To top it all off, Precision Matthews include a 3 year warranty on the machine that is manufactured to ISO 9002 credited standards. Voltage / Phase / Amps 120 Volts, 10 Amps Max. Impressive spindle speed range of 50 – 2000rpms. The PM-1030V from Precision Matthews is an interesting addition to our top 5 best mini metal lathe review list. The brand does have the widespread recognition the likes of the Grizzly, Shop Fox and Jet enjoy, however that should not put you off. Well built, with some great features at good price. Overall it comes highly recommended for those that cannot stretch the budget to some of other selections. The final machine in our top 5 round up is the lowest priced lathe reviewed here. For this reason it is also has the smallest capacity with its 7 x 14 inches swing bed, (with digital speed readout we would like to add). For some users this will be a deal-breaker from the very start, you may understandably require a bigger machine than this. 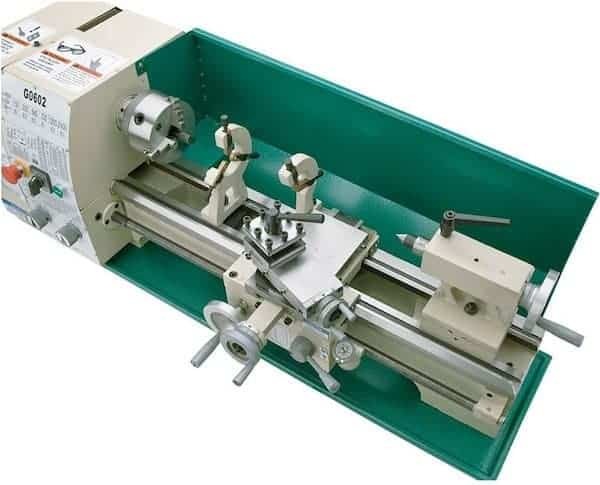 However, for anyone looking for a reliable mini metal lathe that will not require a hefty investment, the EDT could well be the machine for you. For an indication of its capabilities, the manufacturers advise that the EDT is designed for Mini Precision Parts Processing, Sample Processing and Modeling Works. Under the hood is a 0.53 HP, 550W, 110v (one-phase) motor. Again, this being the smallest lathe of our top 5, the power available does not compete with the others in our list. The EDT is capable of variable speed and with a very good range too. The 100-2500 RPM variable system provides great versatility for a lathe of this size. Metal turning. O.D. and I.D. 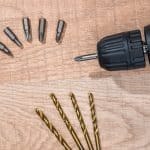 turning can all be carried out using the EDT; as can drilling, threading, and cutting tasks using a range of materials. The machine utilises a Spindle Taper of MT#3. The tailstock taper is MT#2. (Both being specifications we recommend in our lathe buyer’s guide). A range of metric threads can be used on the EDT, (.5-2.5″). The machine also has the capacity for imperial threads of 12-52 T.P.I. A 5/16″ HSS carbide tipped 5 piece cutting set is included with the sale. 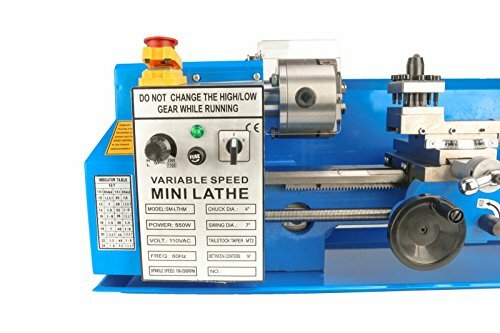 Small and affordable mini lathe ideal for home hobby and model use. The EDT mini lathe is a great option for the hobbyist or modeller looking to carry out fine and intricate work. 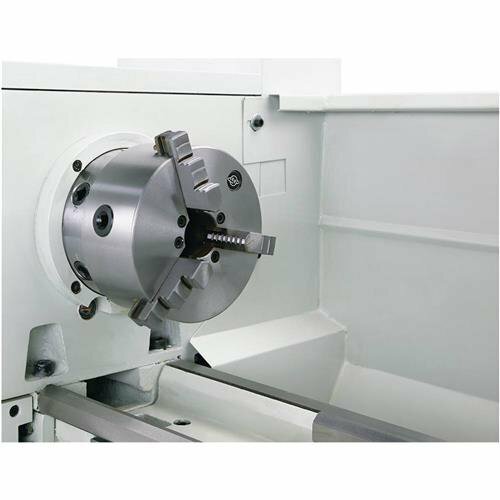 The lathe is specifically designed for mini precision parts processing, sample work and modeling works. Small, affordable and reliable, for those looking for such a tool, the EDT comes highly recommended. Buying a metal lathe for your home or workshop is a big decision. Because of this we have created a comprehensive buyer’s guide on what you should look for before you go ahead and hand over your hard earned cash. 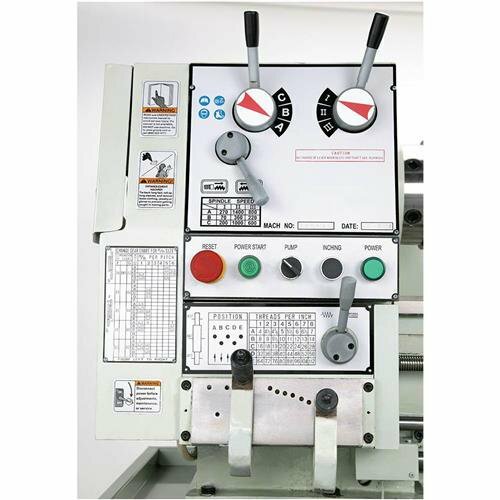 Below you can click on the tabs to see the lathe features that we recommend. 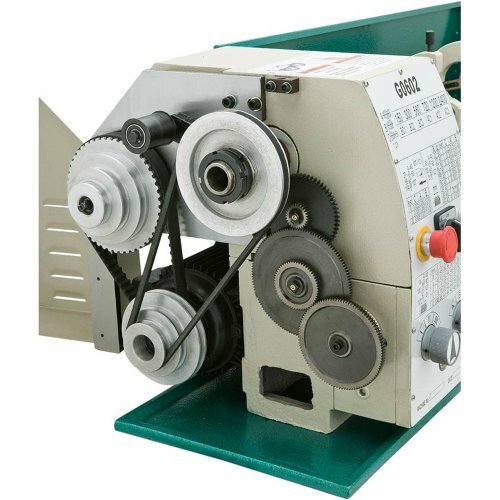 Some of the terms listed in the tabs above may be slightly foreign to you, especially if this is your first time buying a metal lathe. 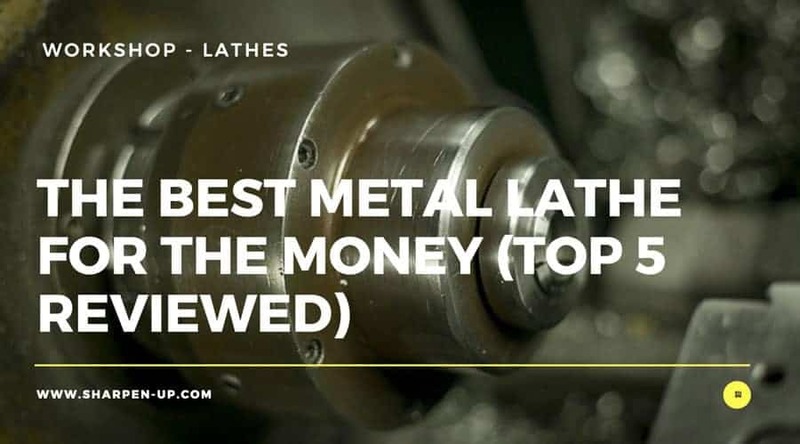 Don’t worry, before we reach the in depth reviews of each of our top pick metal lathes, we will dig deeper and take a comprehensive look at what you should consider when buying one of these versatile machines. A good place to start would be the size of the lathe. You need to consider the types of work you will be aiming to do, along with the space you have available. If you only have a corner of shed with which to work, you will obviously require a smaller machine. 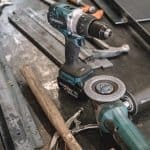 Conversely, if you have a large workshop area or require a lathe for professional use, space will not be a factor and you should buy the best metal lathe that your funds will allow. It is important to understand that America brands label lathe sizes differently to those being sold in Europe. If you see a lathe branded as 4″ x 24″ in the UK, it is the centre height (or throw) being quoted. In other words you are being told about the distance from the centre of the chuck to the nearest point on the bed. So, going with our example above, the centre height is 4 inches, and the length of material the machine can work with is 24 inches. Now, fly across the Atlantic to America and those dimension need to be read differently. This means that the example dimension above would be 8″ x 24″ to the American customer. What size lathe should you go for? 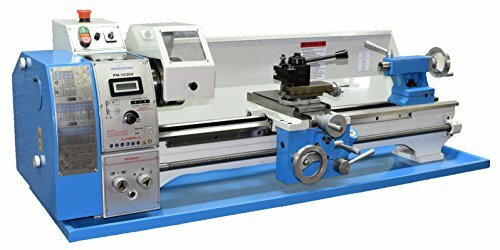 For most home machinists and small workshops choosing a lathe between 6” x 15” and 12” x 30” should certainly cater for your needs. However, as mentioned earlier, space has to be considered. While the smaller lathes are light enough to lift off the bench manually, a larger lathe will require an engine crane to manoeuvre. Once it’s in your workshop, you will not want to move it anytime soon. 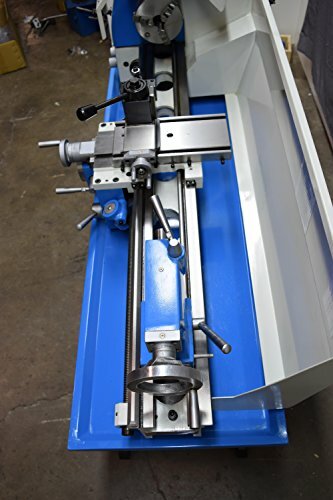 The majority of metal lathes on the market today are constructed with a headstock and spindle assembly designed to handle all loads and speeds a home machinist / workshop owner is likely to need. That being said, one variable to look out for when buying a metal lathe is a machine that uses ball or taper roller bearings in the headstock. The simple reason for this is longevity and ease of repair. Ball or taper rolling bearings are a lot easier to replace once they become worn. With a plain-bearing set-up you risk a scenario where both the bearings and spindle become worn (and will be expensive to repair). With a ball and roller bearing system the cost of maintaining the headstock is reduced. A backgeared system sees the gears mounted at the rear of the headstock. With the ability to manipulate the backgear, the operator is able to reduce the spindle speed while increasing the torque. The end result is far greater control. The ability to run a material slowly within the the lathe is important when dealing with large-diameter work pieces. Faceplate-mounted jobs such as brake discs can be turned successfully with a backgeared system. 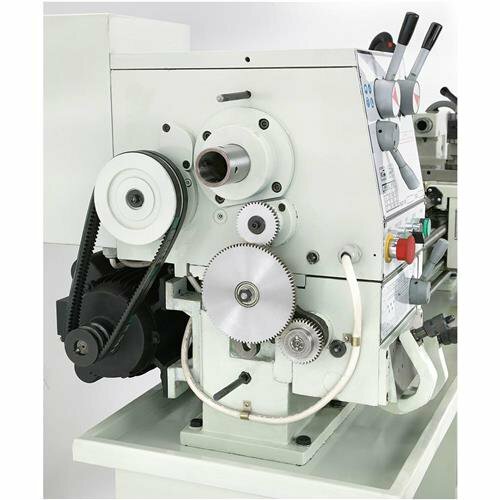 Essentially, the best mini metal lathes with geared speed control will be able to cut threads (screwcutting), while also be capable of heavy-duty drilling, big-hole boring and large-diameter facing. Beyond backgears as a way to manipulate spindle speed, the best metal lathes will feature variable speed motor control. The spindle-speed range you should look for starts from 30 to 80 rpm, and have the ability to go right up to around 1200 rpm. This rpm capability is adequate for the tasks a home machinist / small workshop engineers will require. Of course, some machines will take this higher. If the range of your chosen model hits up to 1200 rpm (some large heavy-weight lathes can reach 2000 r.p.ms), then great. However, really high speeds are often unnecessary except for very specific work, or polishing. We mentioned screwcutting in our essential metal lathe features tab at the beginning of the buyer’s guide. This is definitely a task you will want your lathe to be capable of. 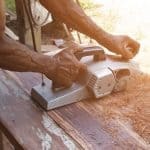 However, screwcutting generally requires slow speeds of between 25 and 70 rpm, (so you will need to ensure your machine has rpms within that). If the lowest speed you can go is too high, you will not have the control to cut screws and the job will be very difficult indeed. Lathes that are advertised as “screwcutting”, will sometimes merely have a power feed along the bed. You should not settle for this. Gear driven low speeds (such as the backgeared systems we recommend above) are what you need for successful screw cutting. 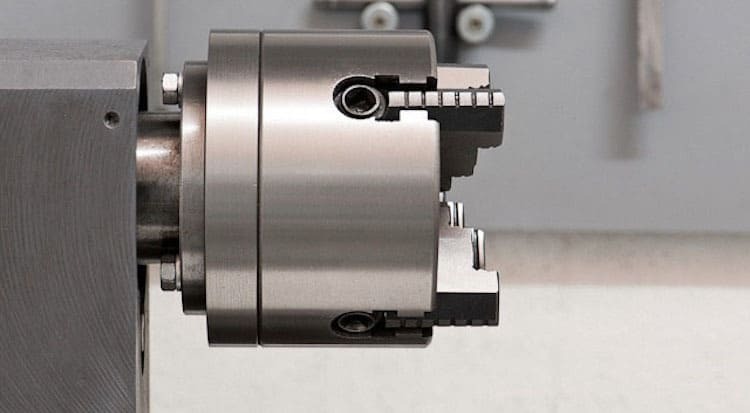 Budget lathes will approach screwcutting via “changewheels” where the change of pitch adjusts speed, (but require the gear train to be reset). On the other end of the spectrum, expensive lathes will include a screwcutting gearbox. Here, the changes of pitch or feed rate are much more efficient and are adjustable by one or more levers. 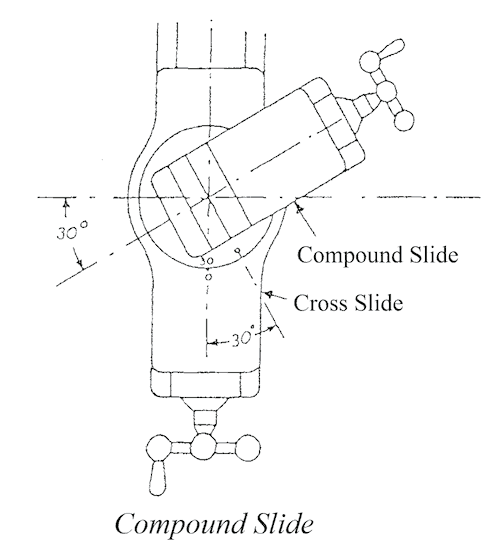 When buying a metal lathe you should look out for those models that feature a “compound slide rest”. This is a handy slide mechanism that moves across the bed, with a separate tool slide bolted to it which can be angled round. 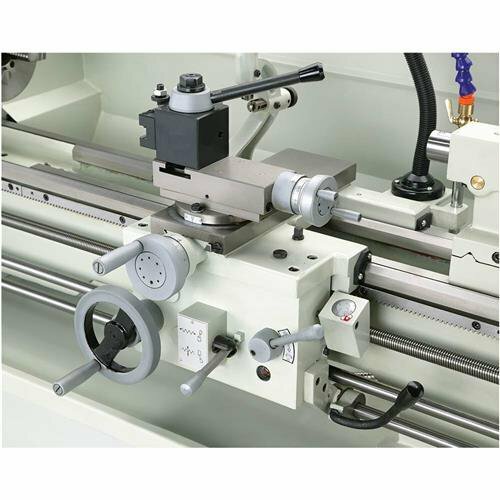 Most lathes are supplied with a single-tool holder or a 4-way toolpost. 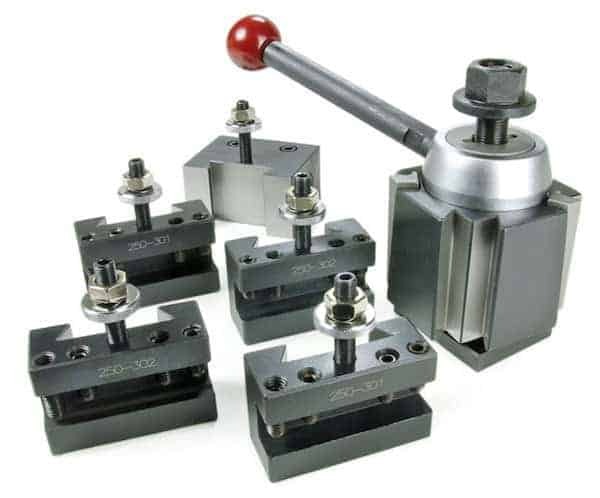 The single holder is generally found on lower priced lathes, however this is normally more than adequate for everyday use, and can often be adapted to fit tools for specific jobs. That being said, if you can get your hands on one, a 4-way toolpost will pay dividends. The best set ups have a selection of holders, each with its own tool, that can be swiftly interchanged as required. Tumbler reverse is a great feature that you will find on some quality lathes. Put simply, the system is a gear mechanism that has the effect of reversing the direction of travel of the carriage. Operated via a lever or a twistable knob, the impact of tumbler reverse means you can change the direction of your cutting tool. The Gap bed is another great feature. If you have this alongside backgear capability, your small metal lathe will be capable of work well above its general station. In many cases the gap is a simple step down in the bed below the chuck. In other designs, the gap comes from the fact you can remove a section of the bed. The best metal lathes on the market today will feature a Morse taper in the headstock and tailstock. You should pay attention to the size of this taper. A no.2 or 3 Morse is generally recommended. If the taper is a No. 1 Morse it will be more difficult to work with. Most small metal lathes will have V belt drive systems. Other options include electronic variable-speed drives, or an old style countershaft, (however these are much less common today). When it comes to selecting which is right for you, there is very little between them. User reviews are a good starting point with which to see how reliable the model lathe you are interested in actually is. Buying a lathe is an investment and you will want your new machine to last for many years. Even brand new lathes can have teething problems with the way that have been configured upon leaving the factory. In many cases you will need to fine-tune the fittings yourself after delivery of your new toy. However, if you encounter backlash in the feed screws, play between carriage and bed, or a headstock spindle that fails to rotate smoothly – this is a sign that some of the components are faulty. Manufacturer warranty may have to come into play. 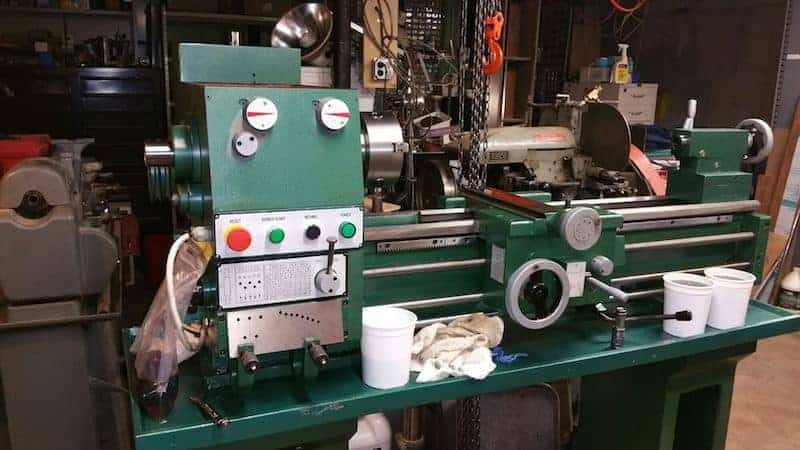 When looking to buy a metal lathe, you want to know that not only is the manufacturing process as stringent as possible, but that the materials used are of high quality too. Robust and durable are the name of the game here. And not just for the main body of the lathe. All components have to be made to last. The quality should even reach to the plastic knobs on the end of your levers; if these break too easily, your machine will be frustrating to use. 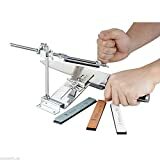 Again user reviews and industry opinion are your go-to guides on this, (as well as our top 5 metal lathe reviews below). These will give you an indication of the brands you can trust, and whether prior customers have had any issues with the lathe that they have bought. Finally, we will quickly discuss the issue of power. Most small metal lathes opt for an electric motor of between 1 and 3 h.p. However, some lathes will run on a 1-phase power supply and can be plugged into a domestic outlet. Others will run off a 3-phase supply that will require a professional wiring job or a converter / invertor. The key issue is to not let a 3-phase system be a deal breaker. Inverters are relatively inexpensive to pick up and are easy to use.